The Museo Nacional Centro de Arte Reina Sofía, the most important institution of modern and contemporary art in Spain and internationally, contracted Biko to develop an ambitious project around Picasso's most charismatic artwork. Located in the center of Madrid, it is a must see for tourists, art lovers and scholars. Its collection is intrinsically linked by history and time and perhaps its most iconic work is Guernica by Pablo Picasso. To talk about Guernica is to talk about Spain’s most iconic 20th century work of art. Its life is intertwined with the history of Spain and of the world, from its creation in the middle of the Spanish Civil War, through its travels around the world, to its return to Spain after the transition to democracy. What challenge did we take on? A comprehensive collection of all the documents that could be found related to the painting and its history. The largest study of high-resolution images that has ever been carried out on a painting. How could we take advantage of the online medium to create a digital product that would live up to expectations? That was the challenge that we faced, and which has kept us motivated from then until the launching of the site. Our first challenge was to give form to the project, so we started with a joint definition phase with the researchers and those responsible at the Museum. Documentary archive, where site visitors can consult everything from the letters to Picasso commissioning the painting, to the photos of its arrival in Spain in 1981. A powerful search engine encourages the exploration of stories that explain the history of Guernica and provides additional information about its protagonists. Chronology, through which the entire catalog of documentation can be explored using a spectacular interactive display. Gigapixel, a technology that allows any user to discover Guernica from a perspective that was unthinkable before. The largest image of an artwork ever captured offers the possibility of studying the painting with natural, ultraviolet or infrared light, and X-rays. MU Health Care’s legacy website struggled to convert prospective patients, lacked a consistent content strategy and information architecture, and lagged in delivering a strong UX for mobile users. The website was built on a proprietary web content management system (WCMS) that limited the client's ability to effectively manage their website and support the needs of their diverse audiences. MU Health Care partnered with Centretek to lead a strategy engagement that involved a wide number of internal stakeholders and consumers. Together, Centretek and the client developed clearly defined objectives, personas, measures of success, and guiding principles for the new website. The Centretek team then lead the website redesign and development in Drupal 8. Layouts remains a strategic priority for Drupal 8 as it was the second most important site builder priority identified in my 2016 State of Drupal survey, right behind Migrations. I'm excited to see the work already accomplished by the Layout team, and look forward to seeing their progress in Drupal 8.5! If you want to help, check out the Layout Initiative roadmap. Special thanks to Angie Byron for contributions to this blog post, to Tim Plunkett and Kris Vanderwater for their feedback during the writing process, and to Emilie Nouveau for the screenshot and video contributions. The top two requested features for the content creator persona are richer image and media integration and digital asset management. The results of the State of Drupal 2016 survey show the importance of the Media Initiative for content authors. With a Media Library content authors can select pre-existing media from a library and easily embed it in their posts. Having a Media Library in core would be very impactful for content authors as it helps with both these feature requests. The Media Library work uses the new Media API in core. Now that the new Media API landed in Drupal 8.4 we can start focusing more on the Media Library. Due to bandwidth constraints, we don't think the Media Library will be ready in time for the Drupal 8.5 release. If you want to help contribute time or funding to the development of the Media Library, have a look at the roadmap of the Media Initiative or let me know and I'll get you in touch with the team behind the Media Initiative. Special thanks to Angie Byron for contributions to this blog post and to Janez Urevc, Sean Blommaert, Marcos Cano Miranda, Adam G-H and Gábor Hojtsy for their feedback during the writing process. Everyone is jumping on the localization bandwagon because it’s dawning on enterprises everywhere that creating site content in a customer’s language is one way to personalize their experience and improve engagement. That means more organizations are going to prioritize making their Drupal websites multilingual, so we’ve created a handy checklist to help you get ready. Drupal 7 is a very stable and well-used content management platform and it supports a vast array of modules, but it wasn’t built with multilingual in mind. Making a Drupal 7 site multilingual can be a time-intensive process for developers. To address this issue, the Drupal community went to work to rebuild language support. Drupal 8 was created to understand language from the beginning. Custom or contributed modules or themes don’t have to understand language support--it’s already built in. Drupal 8 is a great platform to work with, not only because it is so multilingual capable out-of-the-box, but also because you can easily expand while maintaining the translatability of your data. The Drupal 8 multilingual core paves the way for more automation, more seamless workflows, and better publication management. Whether you use Drupal 7 or Drupal 8, every Drupal developer who works with contributed or custom modules designed for multilingual or non-English sites needs to know how to build the best integration possible. To make your path to global engagement and localization easier, we’ve created a checklist for getting your Drupal site multilingual ready in five steps. First step in your multilingual prep is to understand your site! Take a look at your customizations, nodes, fields, and modules so you have an idea of the size and scope of your multilingual prep. Let’s be honest though, most of us will never really know our sites completely. But that doesn’t mean you shouldn’t try. Start your multilingual readiness by taking a look at your theme, content, and modules. Next step, review any customizations you have. Make sure all strings are wrapped in a t() function. You need to ensure both your base and sub-themes are multilingual ready. It helps if you use a well-established, multilingual-ready base theme like Zen, BootStrap3, etc. Figure out how many nodes are on your site and familiarize yourself with how and where they are used. Find out how many different content types you have and make note of diverse custom fields. The more types of content, the more complex your site translation will be. It’s also important to know how many languages are currently on the site, so check your node language settings. If they aren’t set up correctly, it can lead to translation barriers down the road. Find out how many modules are installed on your site. For multilingual, the fewer modules installed, the better! When it comes to contributed modules, you’ve got to rein them in. Too many modules can compromise functionality and interfere with site translation. Limit your modules to those that you really need and use. It’s best to have as few as you can (under 200). Be sure to code review your custom modules to ensure all strings are properly wrapped in t() functions. Every Drupal developer who works with contributed or custom modules designed for multilingual or non-English sites needs to know how to build the best integration possible. It’s also good for Drupal themers who want to make their theme templates translation-ready and for those who want to know how to build Drupal multilingual support for modules, themes, and distributions. By doing a little upfront prep, and following this short 5-step checklist, you will be ready to join the legions who are making the switch to multilingual. Learn more about integrating translation in your site, check out the Lingotek - Inside Drupal Module. A big component of this project was the integration of Pattern Lab Starter 8, Phase2's starter theme with Pattern Lab, which acts as the style guide, component library, and prototyping tool needed for a modern approach to theming. Pattern Lab Starter 8 uses Pattern Lab 2 and the same templating engine that powers Drupal 8: Twig. For Ildephonse Bikino (bikilde) of Rwanda, it was supposed to be an uneventful Drupal Global Training Day call-out; he expected 50 people but he got 388! Bikino began working to get local interest in Drupal, sharing information by creating a simple website and posting information about the trainings on groups.drupal.org and sharing it locally. Hoping to reach the room capacity of 50 people, the registrations came flowing in. How do you deal with the logistics of training 388 people? That’s hard! Bikino was committed to the challenge. One session became eight over a number of weekends. Bikino made sure everyone got the opportunity to attend! Bikino's start with Drupal began commonly enough; through his job. Like many small teams, staff get mixed roles and he inherited the website role. His experience grew from there. In 2016 he had the opportunity to attend DrupalCon New Orleans via scholarship through the Drupal Association. This let him discover the global opportunities and connections that open source software and the Drupal community can provide. Bikino says technology offers more than just jobs, it provides local activities, ways to collaborate, and a chance to build knowledge. He plans to create a platform for the Rwanda Drupal community to share skills, projects, opportunities and experience. The local support for the Drupal Global Training Day is a sign of changing times in Rwanda. Those attending the training are educated, but there can be a lack of connection between what they are learning in school and the outside market. Bikino wants to connect those gaps by creating opportunities to learn, build, and develop. Like many countries across the globe, the Rwandan government sees technology as a way to build economic diversity, nurture jobs, and transform the country. The Rwanda Information and Communication Association (RICTA) and partners launched The 1K Websites project, to promote Local Content Hosting. For now most of the websites made are Government, but they are expanding the project. With good internet infrastructure already in place, this is the start of local content creation and websites for business and community..
Diversity in the community is going to be a challenge, but Bikino realises it’s an important one. The Sustainable Development Goals 5 is “achieve gender equality and empower women and girls”, and access to technology in developing countries such as Rwanda is important for sustainability. Bikino is actively working with kLab management to find funds to develop opportunities for women in technology. The last group of the 388 people have just gone through their training. The aim now is to develop local freelancers, do projects within the community, and find mentors to share tips, guidance and best practices. The group would even like to contribute to translating Drupal into the local language (Kinyarwanda). And of course one day, host an African DrupalCon. Peel away the layers of an impressive attendance to a Drupal Global Training Day event, and you have a story about the potential for technology and Drupal to transform people, communities and industry. You can follow and connect with Bikino via Twitter or say hi to him in the Drupal Slack. Bikino is the Deputy Director for ICT in Education Projects with FHI 360. Our next spotlight will be Fatima Sarah Khalid who you may recognise as @sugaroverflow. To those watching DrupalConEur from twitter it looked like no one had more fun than her! Fatima is going to be interviewed by Nikki Stevens who you may recognise as @drnikki. We think it’s going to be very cool. We are also going to have our new Drupal Spotlight site up very soon. We have big ideas! The following blog was written by Drupal Association Premium Supporting Partner, Message Agency. After months of work, hundreds of commits, and lots of new thinking, the Salesforce Suite for Drupal 8 is reaching maturity. There is tremendous interest in these modules, and many enterprises are waiting for this milestone to integrate D8 sites with Salesforce. In an effort to accelerate refinement and adoption of this important contribution, the module’s developers are raising awareness about the release and asking the community to start downloading and contributing. A few months ago at Drupalcon Baltimore, Message Agency announced a release candidate (8.x-3.0-rc1) for the Salesforce Suite in Drupal 8. This collection of modules supports integration with Salesforce by mapping Drupal entities with standard or custom Salesforce objects and pushing Drupal data to Salesforce as well as pulling Salesforce data into Drupal. Since then, we've continued to expand the Suite and build out critical features. We've also continued to groom the 8.x roadmap, solicit community participation through webinars, and build awareness about how to use the modules. With a solid foundation and full functionality, the Suite is beginning to gain traction and see increasing adoption as projects switch to Drupal 8. What’s new in the Suite? The modules are a complete rewrite of the Suite for Drupal 8, and they fully leverage Drupal core’s object-oriented code patterns. Message Agency’s senior software engineer, Aaron Bauman, was the original architect of the Suite for 6.x in 2009 and has continued to support this important tool ever since. He took the lead in porting the modules for Drupal 8, based on feedback from the community, clients, and nearly a decade of experience integrating these two powerful platforms. Queue on failure. There is now an attempt to push synchronization immediately on entity save and enqueue for asynchronous push only on failure. This feature idea is a great compromise between the previous binary sync/async decision point. Test coverage. Testing 3rd-party web services can be tricky, and requires careful planning and mocking. This Salesforce 8.x release includes test coverage for push and pull operations using mock REST features, allowing for proper regression testing and test-driven development. Push queue overhaul, and cron-based push. Drupal 7's asynchronous push left a lot to be desired. Lack of error handling made debugging and troubleshooting difficult to impossible. Lack of optimizations burned unnecessary API calls. Both of these limitations were imposed by Drupal Queue API's fundamental nature. In Drupal 7, our options for extending the Queue system were limited. In Drupal 8, we've implemented a Salesforce Push Queue service, building on Drupal core's overhauled Queue API. We've taken the opportunity to normalize queue items, optimize queue operations, and implement error handling and recovery. Objectification of Salesforce resources. Moving in the direction of a proper REST PHP SDK, we now have proper classes for Query Result, SObject, Salesforce ID, various REST Responses, and others. This not only allows for simple type-hinting across other classes, but also gives developers consistent and reliable interfaces, and paves the way for even greater extensibility in the future. Queue settings per mapping. The Suite now allows administrators to assign sync intervals per-mapping, instead of running all sync operations on every cron run. This feature idea will allow administrators to tweak their synchronizations according to business needs, without the need to implement extensive hook-based logic. Goodbye hooks, hello events. Leveraging Salesforce.api.php, we mapped old hooks onto new events—a key advantage for folks already familiar with the 7.x version. A new plugin system for mapping fields. There has been a mapping UI overhaul. Salesforce Mapping Fields now enjoy their own plugin system, allowing for maximum extensibility. For example, "Record Type" is now its own mapping field plugin type, rather than receiving special treatment in the push and pull systems. Pluggable everything. including the REST Client itself, thanks to Drupal services and Dependency Injection. Examples module. There is now a working examples module with an event subscriber, exported mapping config, and demonstration of using the REST client to connect to an Apex endpoint. The new version also builds in some important re-includes from 7.x - 2.x branch. What is the current status? And how can you help? The Suite has advanced to 8.x-3.0-rc6 and is nearing a stable release. It’s time to start downloading and using the modules to help us identify and smooth out the rough spots. For a quick start overview, watch this Acquia webinar, delivered by Aaron Bauman on how to install and configure the Suite. Keep those issues coming in the queue! Also, major thanks to Acquia's Drupal 8 Module Acceleration Program for connecting us with clients to fund and advance module development. About six months ago we made a significant change to the way that modules, themes, and distributions are created on Drupal.org. In the past, contributors had to first create a sandbox project, and then request manual review of their project in the Project Applications issue queue. The benefit of this community-driven moderation process was that modules were vetted for code quality and security issues by a group of volunteers. Project maintainers who completed this process also received the benefit of security advisory coverage from the Security Team for stable releases of their projects. Unfortunately, the rate of project applications outpaced what volunteers could keep up with, and many worthy projects were never promoted to full project status, or moved off of Drupal.org to be hosted elsewhere. To ameliorate this issue, we changed the process so that any confirmed user on Drupal.org may now make full projects. To mitigate the risks of low code quality or security vulnerabilities we added new signals to project pages: including highlighting which release is recommended by the maintainer, displaying recent test results, and indicating whether the project receives security coverage both on the project page and in the composer 'extra' attribute. We're continuing to work on identifying additional signals of project quality that we can include, as well as surfacing some of this information in Drupal core. We also converted the project applications issue queue into a 'request security advisory coverage' issue queue. We knew this would be a significant change for the project and the community. While many community members were excited to see the gates to contribution opened, others were concerned about security issues and Drupal's reputation for code quality. Our prediction was that the lower barrier to contribution would result in an increase in full projects created on Drupal.org. This would indicate that new contributors or third party technology providers were finding it easier to integrate with Drupal and contribute those integrations back for use by others. At the same time, we also expected to see an increase in the number of full projects that do not receive coverage from the security team. The question was whether this increase would be within an acceptable range, or represent a flood of low quality or insecure modules. The table below provides statistics about the full projects created on Drupal.org in the 5 months before March 17th, 2017 - when we opened the creation of full projects to all confirmed users. * note: full projects that did not have stable releases were not automatically opted in to security coverage when we opened the full project creation gates. As you can see, we have an almost 58% increase in the rate of full projects created on Drupal.org. We can also see a significant proportional increase in two key areas: projects with greater than 50 site usage and no security coverage(up 150% compared to the previous period), and projects that have applied for security coverage(up 344% compared to the previous period). Note: this increase in applications is for projects *created in these date ranges* not necessarily applications created overall. This tells us that reducing friction in applying for security coverage, and encouraging project maintainers to do so should be a top priority. From the overall data we see approximately what we might expect. The increase in growth of full projects on Drupal.org has lead to a modest increase in projects without security coverage. Before the project application change, all full projects with stable releases received security advisory coverage. After this change, only those projects that apply for the ability to opt in(and then do so) receive coverage. What has this meant for security coverage of projects hosted on Drupal.org? 1.92% of all full 7.x and 8.x projects have stable releases, but do not receive security advisory coverage. It is likely no accident that this translates into 464 projects, which is nearly equivalent to the number of projects additional projects added compared to our old growth rate. Of those only 130 of those projects report more than 50 sites usage(or .54% of all 7.x and 8x full projects). The opening of the project application gates has dramatically increased the number of projects contributed to Drupal.org. It has also increased the number of projects without security coverage, and the number of applications for the ability to opt in to coverage among new projects. For now, leave the project creation projects as it stands today - open to contribution from any confirmed user on Drupal.org. Less than 2% of all Drupal projects with stable releases currently lack security coverage. The rate at which this is increasing is significant (and in the wrong direction) but not rapid enough to merit changing the project application policy immediately. Solve the problem of too many security advisory coverage applications. The security advisory application queue has the same problem that the old project applications queue had - not enough volunteers to manually vet all of the applications - and therefore a significant backlog of project maintainers waiting on the ability to opt into coverage. Recommendation: Implement an automated best practices quiz that maintainers can take in order to be granted the ability to opt into security advisory coverage. If this process is as successful as we hope, we may want to consider making this a gate on stable releases for full projects as well. We look forward to working with the Security Working Group to implement this recommendation and continue to improve the contribution experience on Drupal.org, while preserving code quality and security. What's new in Drupal 8.4.0? This new version is an important milestone of stability for Drupal 8. It adds under-the-hood improvements to enable stable releases of key contributed modules for layouts, media, and calendaring. Many other core experimental modules have also become stable in this release, including modules for displaying form errors inline and managing workflows. The release includes several very important fixes for content revision data integrity as well as an update to stop the deletion of orphaned files that was causing data loss for many sites, alongside numerous improvements for site builders and content authors. The Inline Form Errors module provides a summary of any validation errors at the top of a form and places the individual error messages next to the form elements themselves. This helps users understand which entries need to be fixed, and how. Inline Form Errors was provided as an experimental module from Drupal 8.0.0 on, but it is now stable and polished enough for production use. Since there is a rich ecosystem of Drupal contributed modules built on Media Entity, the top priority for this release is to provide a stable core API and data model for a smoother transition for these modules. Developers and expert site builders can now add Media as a dependency. Work is underway to provide an update path for existing sites' Media Entity data and to port existing contributed modules to the refined core API. Note that the core Media module is currently marked hidden and will not appear on the 'Extend' (module administration) page. (Enabling a contributed module that depends on the core Media module will also enable Media automatically.) The module will be displayed to site builders normally once once related user experience issues are resolved in a future release. The "Save and keep (un)published" dropbutton has been replaced with a "Published" checkbox and single "Save" button. The "Save and..." dropbutton was a new design in Drupal 8, but users found it confusing, so we have restored a design that is more similar to the user interface for Drupal 7 and earlier. Both the "Comments" administration page at `/admin/content/comment` and the "Recent log messages" report provided by dblog are now configurable views. This allows site builders to easily customize, replace or clone these screens. Drupal 8.4 continues to expand Drupal's support for web services that benefit decoupled sites and applications, including a 15% performance improvement for authenticated REST requests, expanded REST functionality, and developer-facing improvements. Further details are available about each area in the 8.4.0 release notes. Update to 8.4.0 to continue receiving bug and security fixes. The next bugfix release (8.4.1) is scheduled for November 1, 2017. Updating your site from 8.3.7 to 8.4.0 with update.php is exactly the same as updating from 8.3.6 to 8.3.7. If you use Drush, be sure to update to Drush 8.1.12 or higher before using it to update Drupal 8.3.7 to 8.4.0. Drupal 8.4.0 also has major updates to several dependencies, including Symfony, jQuery, and jQuery UI. Modules, themes, and translations may need updates for these and other changes in this minor release, so test the update carefully before updating your production site. Drupal 6 is not supported anymore. Create a Drupal 8 site and try migrating your data into it as soon as possible. Your Drupal 6 site can still remain up and running while you test migrating your Drupal 6 data into your new Drupal 8 site. Core now provides migrations for most Drupal 6 data, but the migrations of multilingual functionality in particular are not complete. If you find a new bug not covered by the known issues with the experimental Migrate module suite, your detailed bug report with steps to reproduce is a big help! Minor releases like Drupal 8.4.0 include backwards-compatible API additions for developers as well as new features. Read the 8.4.0 release notes for more details on the improvements for developers in this release. Since minor releases are backwards-compatible, modules, themes, and translations that supported Drupal 8.3.x and earlier will be compatible with 8.4.x as well. However, the new version does include some changes to strings, user interfaces, and internal APIs (as well as more significant changes to experimental modules). This means that some small updates may be required for your translations, modules, and themes. See the announcement of the 8.4.0 release candidate for more background information. The Drupal Business Survey 2017 shows that Drupal has a steady position in the market, and Drupal 8 has secured its role as the most popular version for new Drupal projects. Further, Drupal is often becoming part of a larger set of solutions. The Drupal Business Survey is an annual survey that aims to give insights into the key issues that Drupal agency owners and company leaders worldwide face. The survey is an initiative of Exove, One Shoe and the Drupal Association and has been carried out this year for the second time. It covers topics about Drupal business in general, Drupal projects and talent needs. This article summarizes the most important findings along with commentary and insights from a total of 239 respondents. 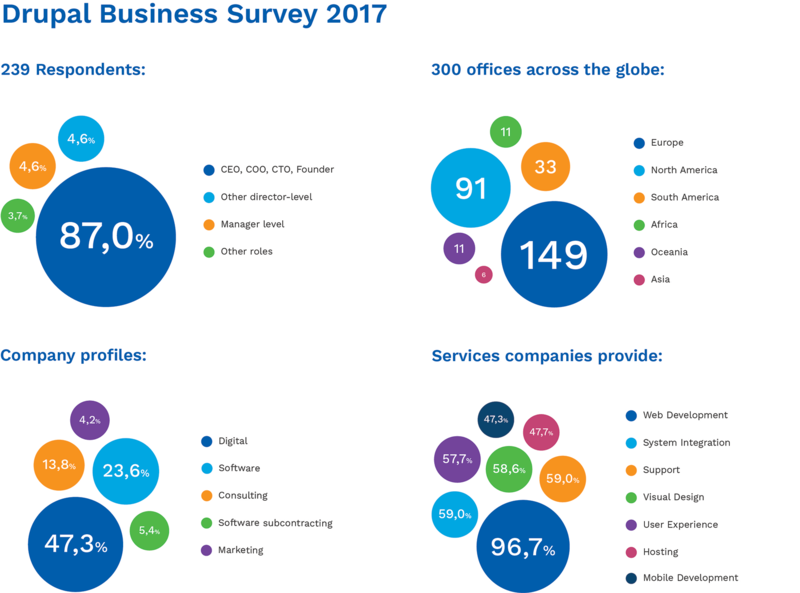 The Drupal Business Survey gleaned its data for 2017 from 239 respondents in CEO/COO/CTO/founder role (87%), director role (4.6%) or management role (4.6%), working at Drupal companies with a total of 300 offices spread around the globe. The most popular office location (30.1%) was USA. The second most popular with 12.1% was UK, and after that Germany, Netherlands, India, Canada and France. There were respondents from Africa, Asia, Europe, North America, South America and Oceania. For almost half of the respondents (48.5%) the Drupal project pipeline grew within the last year. For 28.9% it stayed roughly the same, and for 22.6% the pipeline shrank. For a majority (52.3%) of the respondents the average size of Drupal project deals grew. For about one third (31.4%) the Drupal deal size stayed roughly the same, and for only 16.3% the size of deals shrank. Despite the increasing competition in the CMS market, for many (46.4%) of the companies their Drupal project win rate has stayed on the same level over the last year, and about a third (34.7%) have managed to grow their win rate. For less than a fifth of the companies (18.8%) the win rate had decreased. Drupal’s position as a high-demand service platform is steady, especially for projects in the Charities and Non-Profit sector, which is catered to by two thirds (64.9%) of the respondents. Other popular industries that use Drupal are Government & Public Administration (56.1%) and Healthcare & Medicine (49.4%). There are no major differences in industries served by Drupal companies compared to the 2016 survey results. When choosing the right platform, Drupal clients trust the technical provider’s expertise: Drupal is often chosen by the clients as a result of the provider’s recommendation. In some cases the client’s previous experience or familiarity with Drupal is the definitive factor. Without -most often than not- being able to precisely explain the reasons for which they prefer Drupal, those who do, sense that it is a better solution for their business; we shall imagine that this is due to the image of the CMS, which evokes a more robust, and serious CMS than the others. When Drupal itself is less the dominating factor for the client, other unique aspects are often key factor for clients choosing a supplier, agency, or partner. The respondents mentioned that trust, commitment, quality, level of service, full service proposition, technical expertise, good reputation, and references were important factors for client decision making. Drupal 8, the newest version of the CMS, seems to have taken a strong place in the market. The respondents’ new Drupal projects were most commonly (38.1%) built on Drupal 8. One fourth of the respondents stated that they build mostly with both Drupal 8 and some with Drupal 7. For 18% of the respondents most new project were built with Drupal 7 and some with Drupal 8. A few (6.7%) of the respondents said their new projects are equally often built with Drupal 7 and Drupal 8. 12.1% still built all of their new projects with Drupal 7. Remarkably, despite the popularity of Drupal, the survey shows that a lot of Drupal companies have changed their business model over the last year to widen their services and respond to the demand. The most common way of changing the business model was by expanding services beyond building Drupal websites (35,1%). The data shows that companies start to offer more services, expand their technology stack and work with multiple CMS platforms. In addition to pure web development – coding the sites – most of the companies provide services such as support, system integration, user experience design, visual design, hosting, and mobile development. The companies also found adding other technologies as a useful way of expanding the technology stack. More than half of the respondents’ companies used also Node.js, while Angular (43.5%), Symfony (42.3%) and React.js (33.9%) were also commonly used technologies within the respondents. Some used also Laravel (17.2%), Vue.js (9.6%) and Django (5.9%). Almost half of the companies (45.2%) have added other CMS platforms to expand their services and getting variety to projects. WordPress is the most usual (54.67%) addition to the toolkit, serving particularly smaller projects, with Magento eCommerce platform and Grav CMS following. For most respondents (69.6%), the reason for using more than one CMS tool is being able to use the tool best suited for the project. For almost the half (40.2%) the reason arose from the client's’ wishes on the tool. Drupal is widely considered as one of the most popular options in the CMS landscape. However, while digital solutions have become more complex, Drupal increasingly often serves as a part of a larger set of solutions. The survey data shows that Drupal companies do this in the belief that the company sells solutions rather than technology. There’s a broad range of options available for companies to build platforms. Every Drupal organization seeks different combinations of software products and programming languages that they seem most important for their projects. There are endless options that excel in their own right. Our clients rarely come asking for Drupal (10% of the time ). But our technical prowess is a big part of their choice. That skill just happens to be in Drupal due to our own choice of platforms. [Our Drupal expertise is the most definitive factor] when clients approach us for Drupal projects, if Drupal is not the main reason to approach us (the most common case) then Drupal expertise is irrelevant. When it is a Drupal project the expertise is important but we no longer sell Drupal as a major part of projects. We just use it. We now sell the solution. I sell solutions to digital problems, not solutions to Drupal problems. The study made it clear that there are often other definitive factors than Drupal expertise affecting the client’s decision of choosing agencies. The clients reportedly value vendor’s portfolio and references of previous projects, reputation, communication, and services that differentiate the agency from its peers. 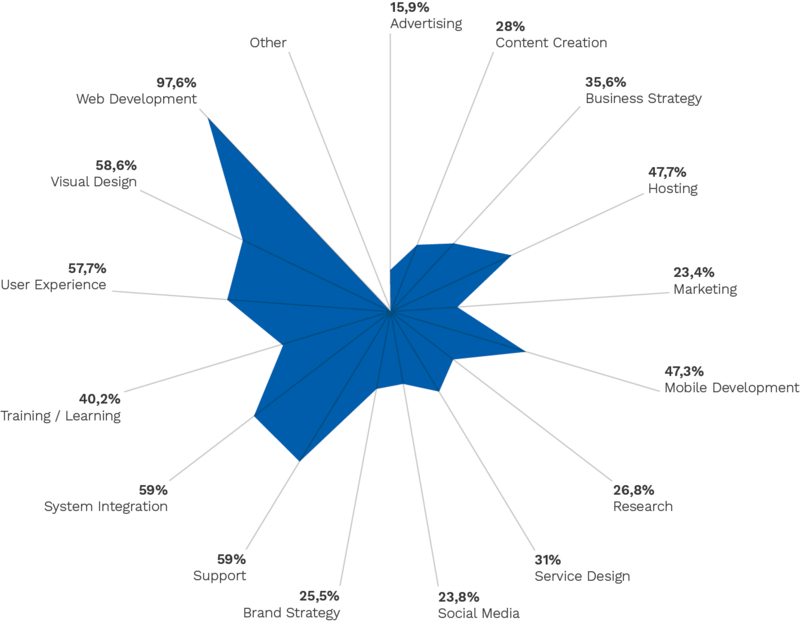 According to the survey, Drupal talent is hard to find and takes a lot of work. 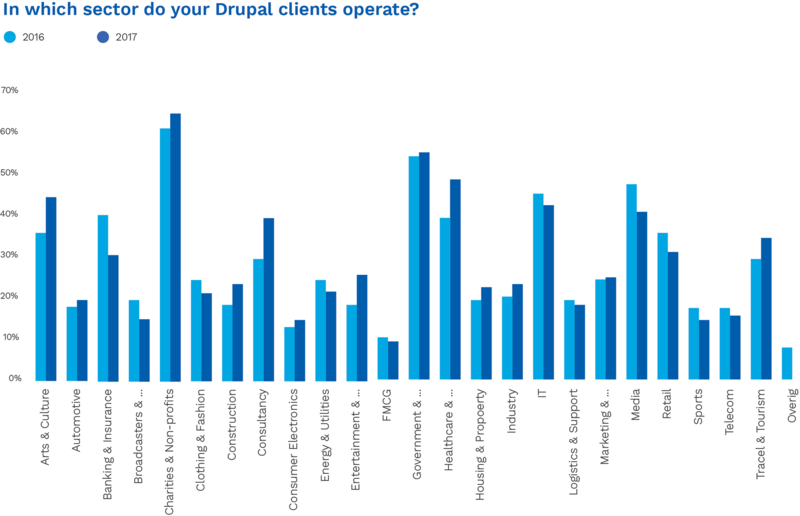 Only fraction (10.9%) of the companies say that they find Drupal talent easily. Compared to last year, the demand for Drupal talent at responding companies seems to be split between decreasing (23.4%) and increasing (25.5%) demand, with demand staying about the same at 36.8%. With Drupal 8 gaining more and more popularity, most respondents say that Drupal 8 skills are somewhat in demand (38.1%) or high demand (33.5%). 15.9% say that Drupal 8 skills are not in demand. 2016/17 and D8 has been a big shakeout for talent in Drupal. 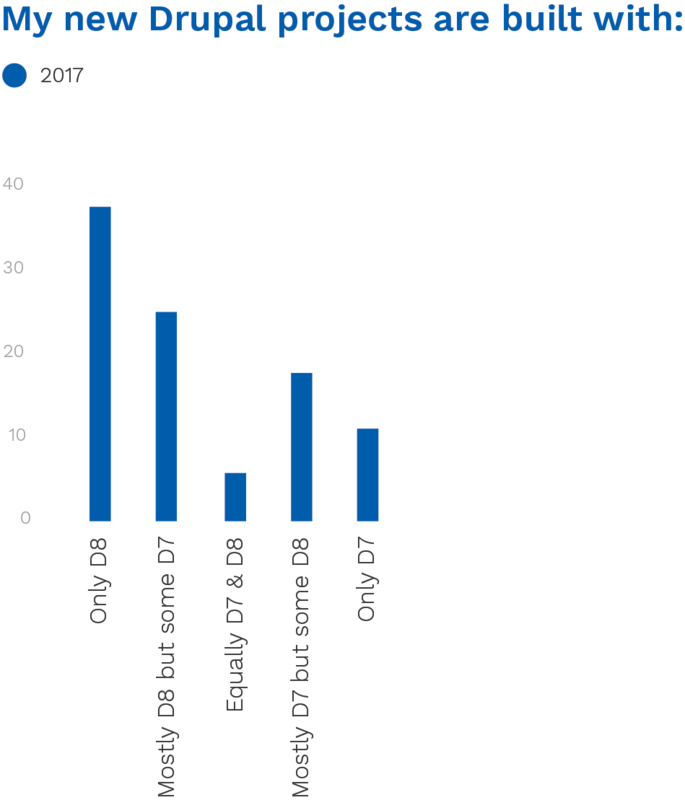 A lot of people who could operate in commercial Drupal delivery in 2012-2015 (with demand outstripping supply markedly) simply will not be viable candidates for Drupal work in 2018. There is no 'easy" work left and many people who came in during the good times will not be able to sustain careers in the new world. Demand, as a whole, for Drupal seems to be significantly dropping as the increased complexity of each major release of Drupal cuts off greater and greater numbers of the ‘do-it-themselves’ business owning client/builder types. These types are prime candidates for initially using Drupal and then later turning their Drupal site over to a professional company. Based on the study results, it is safe to say that Drupal has a steady position in the market, and Drupal 8 has secured its role as the most popular version for new Drupal projects. The content management market is shifting towards more comprehensive and also complex solutions. Drupal agencies are well positioned to respond to this trend due to modern Drupal 8 architecture and also by combining Drupal into larger solutions. This drives Drupal business into larger deals and allows more long-term partnerships with the clients, thus giving financial stability to the companies and also to the community. On the other end of the market, Drupal also faces competition from low-end solutions such as Wordpress. Some of the agencies now offering other content management solutions, Wordpress included. The market might be challenging for smaller companies with only one CMS in their toolkit. Companies that can react to changing market conditions and provide a variety of solutions are going to succeed. Additiionally, companies that are able to distinguish themselves from other vendors through a good set of services, specialisation, or excellent customer service will flourish. This is all part of a natural evolution of any digital platform marketplace and it should be seen as a good juncture to raise the Drupal agencies to the next level. Talent finding challenges indicate that there will be a need for multi-skilled developers with very good technical expertise. More detailed results of the survey will be published at the DrupalCon Vienna CEO Dinner on Wednesday, September 27th. The presentation will become available for download afterwards. The Drupal Association is a non-profit organization headquartered in Portland, OR, USA. It helps the Drupal project and community thrive with funding, infrastructure, and events. Its vision is to help create spaces where anyone, anywhere, can use Drupal to build ambitious digital experiences. For more information, please visit drupal.org/association. Drupal.org uses the Fastly CDN service for content delivery, and Fastly has depreciated support for TLS 1.1, 1.0, and 3DES on the cert we use for Drupal.org, per the mandate by the PCI Security Standards Council. This change took place on 9 Aug 2017. This means that browsers and API clients using the older TLS 1.1 or 1.0 protocols will no longer be supported. Older versions of curl or wget may be affected as well. DrupalCon Vienna is almost here! From September 26-29 you can join us for keynotes, sessions, and sprinting. Most of the Drupal Association engineering team will be on site, and we'll be hosting a panel discussion about recent updates to Drupal.org, and our plans for the future. On August 3rd, Drupal 8.4.0 received its alpha release, followed on the 17th by a beta release, and on September 6th by the first release candidate. Several new stable API modules are now included in core for everything from workflow management to media management. Core maintainers hope to reach a stable release of Drupal 8.4 soon. We made a number of improvements to project pages in August, one of which was to clean up the 'Project information' section and add new iconography to make signals about project quality more clear to site builders. In the same vein, we've also improved the download table for contrib projects, by making it more clear which releases are recommended by the maintainer, providing pre-release information for minor versions, and displaying recent test results. Developers who build Drupal sites using Composer may miss some of the project quality indicators from project pages on Drupal.org. Because of this, we now include information about whether a project receives security advisory coverage in the Composer 'extra' attribute. By including this information in the composer json for each project, we hope to make it easier for developers using Composer to ensure they are only using modules with security advisory coverage. This information is also accessible for developers who may want to make additional tools for managing composer packages. Just about the last step in resolving any code-related issue is for a project maintainer to commit the changes. To make sure these maintainers are credited for the work they do to review these code changes, we now automatically add issue credit for committers. With DrupalCon coming up in September we spent a little bit of time tuning the performance of Events.Drupal.org. We managed to resolve a session management bug that was the root cause of a significant slow down, so now the site is performing much better. A long requested feature for our DrupalCon websites has been the ability to sync a user's personal schedule to a calendar service. In August we released an initial implementation of this feature, and we're working on updating it in September to support ongoing syncing - stay tuned! We've added a call to action for new members on the Drupal.org Download and Extend page, which highlights some great words and faces from the community. Membership contributions are a crucial part of funding Drupal.org and DrupalCon, but much the majority of traffic we receive on Drupal.org is anonymous, and may not reach the areas of the site where we've promoted membership in the past. We're hoping this campaign will help us reach a wider audience. DrupalCI is one of the most critical services the Drupal Association provides to the project, and also one of the more expensive. We've recently added a very small section to highlight how membership contributions help provide testing for the project - and in the future we hope to highlight sponsors who will step up specifically to subsidize testing for the Drupal project. In August we added more semantic labels for DrupalCI test configuration. This means that project maintainers no longer have to update their testing targets with each new release of Drupal, they can instead test against the 'pre-release' or 'supported' version, etc. More information can be found in the DrupalCI documentation. In August we also began a PCI audit, and developed a plan of action to reduce the Drupal Association's PCI scope. Protecting our community's personal and financial information is critically important, and with a small engineering team, the more we can offload PCI responsibility onto our payment vendors the better. We'll be continuing to work on these changes into the new year. The Drupal Association Board of Directors will meet twice during DrupalCon Vienna. They have a board retreat the weekend before the conference and there is an open board meeting during DrupalCon for the community to attend. Below are details about each meeting. During a retreat, the board and the Executive Director meet in an extended executive session to plan and discuss the strategy for the Drupal Association. Normally, the retreat lasts two days and non-board members including staff are invited to participate in presentations and discussions on specific topics. However for the upcoming retreat in Vienna, we will be exploring a holistic view of the strategy for Drupal and are structuring the retreat differently to accommodate this expanded conversation. The board will meet again during DrupalCon Vienna on Wednesday, 27 September from 11:45 - 13:00 in the convention center Business Suite 3-4. This is open to the community and lunch will be served to all who attend. You can also attend remotely via Zoom. See the dial in information below. 8.4.x includes new stable modules for storing date and time ranges, display form errors inline and manage workflows. New stable API modules for discovering layout definitions and media management are also included. The media API module is new in core, all other new stable modules were formerly experimental. The release also includes several important fixes for content revision data integrity, orphan file management and configuration data ordering among other things. You can read a detailed list of improvements in the announcements of alpha1 and beta1. Drupal 8.4.x is backwards-compatible with 8.3.x. However, it does include internal API changes and API changes to experimental modules, so some minor updates may be required. Review the change records for 8.4.x, and test modules and themes with the release candidate now. Some text changes were made since Drupal 8.3.0. Localize.drupal.org automatically offers these new and modified strings for translation. Strings are frozen with the release candidate, so translators can now update translations. All outstanding issues filed against 8.3.x were automatically migrated to 8.4.x. Future bug reports should be targeted against the 8.4.x branch. 8.5.x will remain open for new development during the 8.4.x release candidate phase. For more information, see the release candidate phase announcement. Let's face it, it's been a crappy year in many ways. Internally and externally there are pressures that have made all of us think "what's the point?" Instead of a world where we build and move forward together there is conflict, uncertainty, and so many why moments. From the macro to the micro, communities and ecosystems are struggling. The ideals of open source software often feel exploited, and the feeling of wonderment and discovery as we build together has been cast aside to something that feels very much like... well, work. TL:DR; Our community is full of amazing people. Let’s celebrate them. Join the Community Spotlight committee to review community-nominated heroes so we can recognize and celebrate those who have contributed to Drupal in special ways. Drupal is a single expression of collaboration amongst thousands of people from around the world who are passionate, smart, and caring. They donate countless hours, moving the project forward by contributing code, mentoring new contributors, writing documentation, organizing camps, sharing knowledge, and so much more. These selfless acts are Drupal’s lifeblood and deserve being celebrated and appreciated. It’s clear from a recent #drupalthanks twitter-fest that our community is eager to show their appreciation for each other. That is why, the Drupal Association, with the help of Lyndsey Jackson, is re-launching Community Spotlight, a program that highlights community-nominated heroes who have contributed to the project in a special way. This program went on hold last year when the Drupal Association downsized, making the organization more sustainable. Lyndsey offered to bring the program back by forming a committee who will select nominees to be highlighted on Drupal.org and through Drupal Association communication channels. The Drupal Association is thankful for Lyndsey’s passion for celebrating the community and for making time to bring Community Highlights back. Lyndsey has a great vision for the program. In her own words, she says: "We want the Community Spotlight to represent a shared story or an experience that will resonate and connect with where the community and the project is at that point in time. We want to highlight the depth of experience that exists, and the evolving potential through emerging leaders and new energy"
Will you join the Community Spotlight Committee? Lyndsey is creating a Community Spotlight committee to drive this important program forward. It will consist of 3-5 people with diverse backgrounds. They will review the community-nomination forms and pick who we will celebrate. They will also help convert the nomination form into a blog post, which the Drupal Association will promote. The monthly time commitment would be about 2-4 hours. This group also has the autonomy to evolve the program. I’m sure there are many ways we can improve how we celebrate our community. To join this committee, please complete this form.